Steve Jobs made an appearance yesterday, June 7th, before the Cupertino City Council to pitch the local governing body on Apple’s ambition to build a new campus. The site for the building to house 13,000 employees is the original home of HP’s computer systems division, land that was recently sold to Apple. The property is currently covered by a series of big asphalt parking lots. Apple’s plan would increase the landscape coverage from 20 to 80 percent with the help of a senior arborist from Stanford who will help restore some of the indigenous plant life to the property, including the apricot orchards. Apple plans to make the campus’ energy center the facility’s primary power generator using natural gas and other “clean energy” sources — the city would simply provide backup power when needed. Of course, what would a Jobs presentation be without a few choice superlatives? In this case, Jobs claims that the new curved-glass facility will be the “best office building in the world,” luring in students of architecture anxious for a peek. 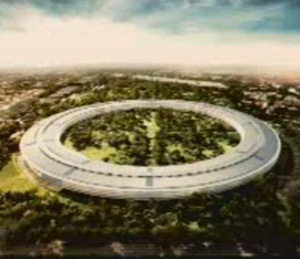 Apple plans to break ground in 2012 with a 2015 move-in date.